Seamlessly capturing contacts information from business cards in 21 languages, ABBYY Business Card Reader (BCR) is a powerful multi-function contact data management application that makes it effortless to enter and manage your business contacts. – Sync cards data across Android and iOS (iPhone, iPad) via ABBYY’s cloud storage (available in BCR Pro). System requirements: OS Android version 4.0 and above, camera with auto focus. ✓ Forget having to manually enter contact details into your smartphone. Unsurpassed data recognition and speed based on famous ABBYY Mobile OCR technology, eliminate having to correct or re-key business cards data, making creating new contacts easy and automatic. ✓ Sync cards across Android and iOS (iPhone, iPad) to make business cards database trouble-free, updated and accessible from all your mobile devices (available in BCR Pro). ✓ Card Holder, the BCR’s own storage, provides convenient business card search, as well as sorting and grouping of contacts. You can quickly and easily find biz contact you need. ✓ ‘My business cards’ group in Card Holder allows to save your own business cards in different languages and for different biz occasions. ✓ Text notes to cards easy to make, edit, look through and find in BCR’s storage (available in BCR Pro). 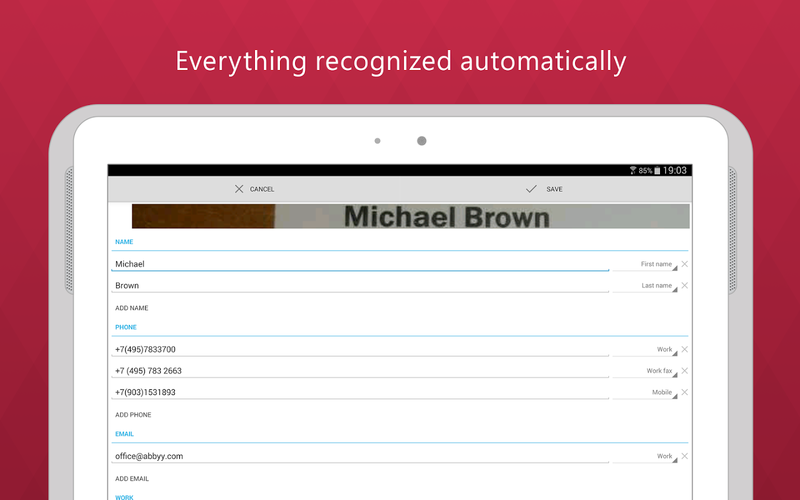 ✓ Quickly verify contacts recognition results. The BCR highlights uncertain characters and displays the original image so that you can confirm or correct the app’s output. ✓ Forward recognized contact data from Card Holder via e-mail as VCard and JPEG file or via SMS as a plain text. 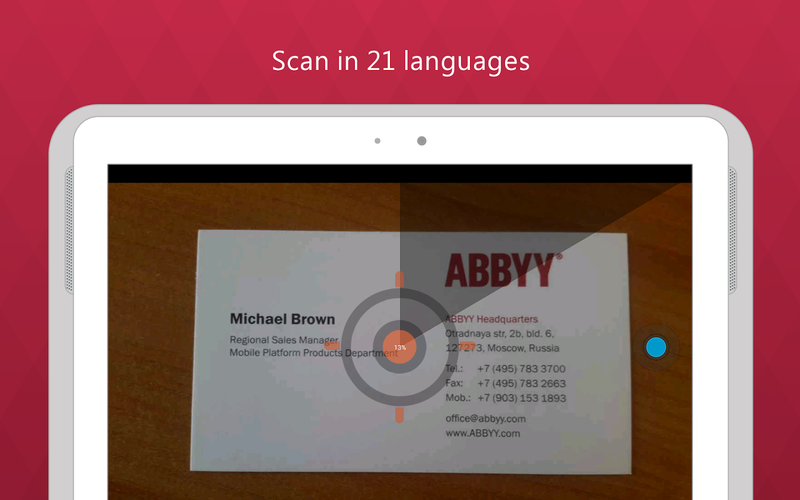 ✓ Cross-platform sharing of business cards across Android and iOS for all businessman using ABBYY Business Card Reader (thanks to AllJoyn™ by Qualcomm Innovation Center Inc.). ✓ Find out more about your new biz contacts on the most popular social networks – Facebook (in BCR Pro you can also search on Linkedln, and Twitter). ✓ Search in Maps for the address of your biz contact with just one tap from ABBYY Business Card Reader (available in BCR Pro). 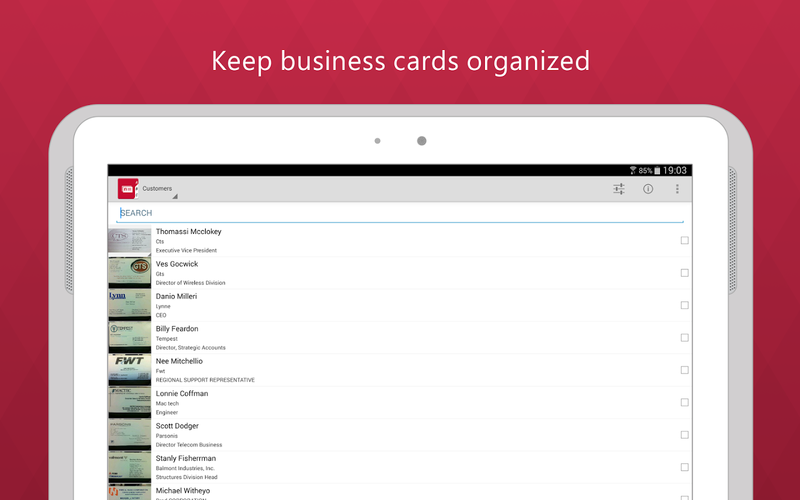 ✓ Backup and restore contacts from saved business cards. ABBYY Business Card Reader makes your business cards and contacts work. • Save data from First and Last Name and first detected Phone number.